People often mistakenly refer to the rutabaga as a “turnip”. 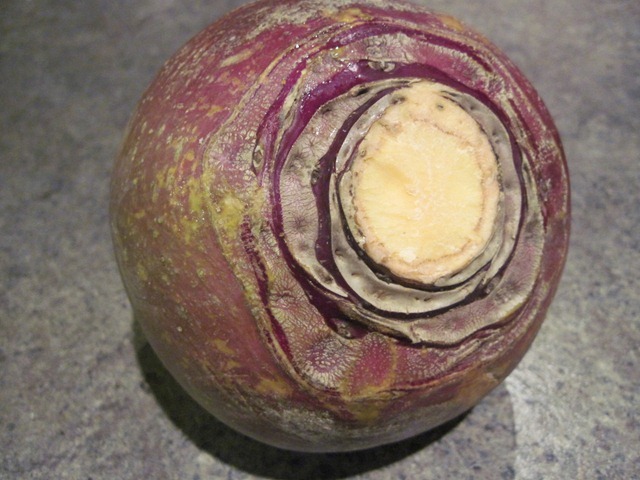 You may call it a “swede” or you may call it a “winter turnip” but the singular “turnip” is quite simply incorrect. 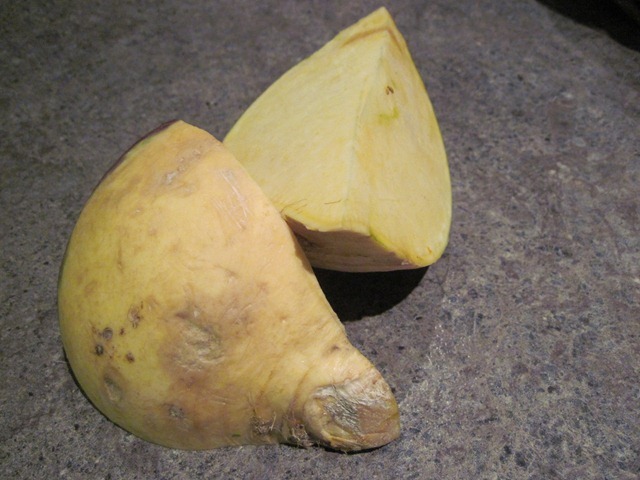 The rutabaga is “Brasssica napus L. var. napobrassica” and the turnip is “Brassica rapa L. var. rapa”. I hope that clears up that little mystery for you. If that explanation is not terribly helpful then how about this. 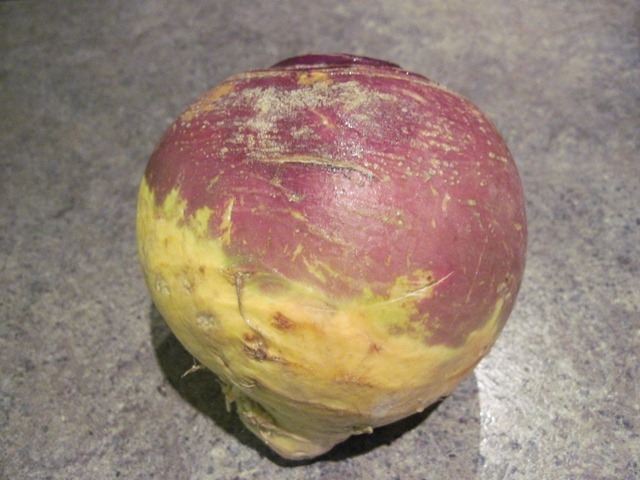 The rutabaga is a big globe shaped root with a bright purple skin over the top two thirds; the remaining one third is yellow. Rutabagas differ from turnips in that the leaves resemble cabbage leaves; the root has a distinct neck; the flesh is firmer and it keeps well during the winter months. It is also more nutritious. It is safe to say, I think, it is not a pretty vegetable. Rutabaga is an old fashioned vegetable and today many people don’t know their rutabagas from, well, their turnips. It can be boiled like potatoes and mashed with potatoes or it can be dragged in from the 16th century and roasted to bring it into the twenty first century. 2. Winter vegetables like rutabaga and carrots take longer to cook than early season vegetables. 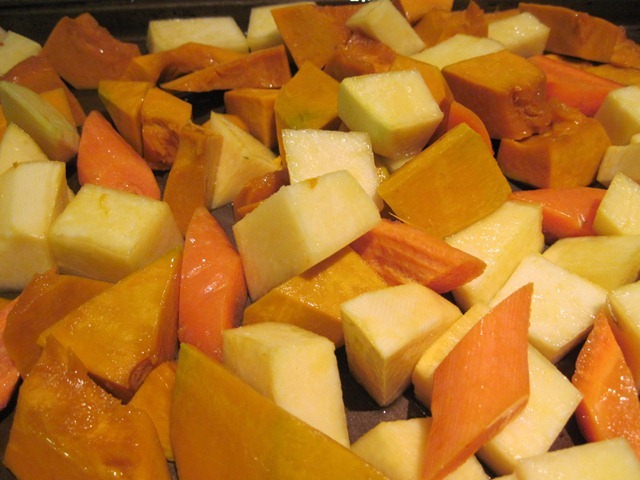 Depending on the type of squash used, you might consider roasting the carrots and turnips for 20 minutes before adding the squash. Put cubed vegetables on a rimmed cookie sheet. Drizzle with olive oil and vinegar and, using your hands, massage oil and vinegar into vegetables. Sprinkle with coarse sea salt. 3. Place in oven for 45 minutes. 4. Serve these as a side dish or as a vegetable hash with a poached egg. Either way, you will get a new appreciation for the lowly rutabaga. Thanks for following. Next time we will look at another rutabaga recipe as they are generally quite large and there will be plenty left over even after you have made this simple recipe.